Here's a dish that needs no introduction. Like home, you will always look forward to eating Lumpiang Gulay because of it's simplicity. With Knorr Pork Cubes, everything taste better. 1 Get a pan and make it nice and hot over medium heat. Pour some oil and throw in the onions and garlic. Saute for a few minutes before adding the togue and carrots. 2 Add green beans next and Knorr Pork Cube. Cook for 1 minute and add malunggay leaves. 3 Saute the vegetables until cooked through. 4 Place about 2-3 tablespoon of the mixture into the wrapper and roll. 5 Fry in a pre-heated pan with oil and cook until golden brown. With your favourite condiment, eat as much as you want without the guilt. 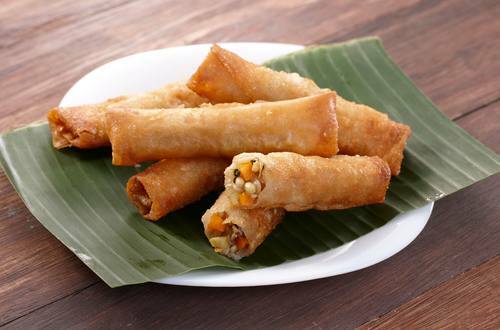 For Lumpiang gulay is healthy and delicous!